NANAIMO — Fall is fully in swing and despite what's happening in the Vancouver market with news about price corrections, Nanaimo's real estate market is reacting differently. In fact, Vancouver Island wide, prices continue rising despite moderating sales. 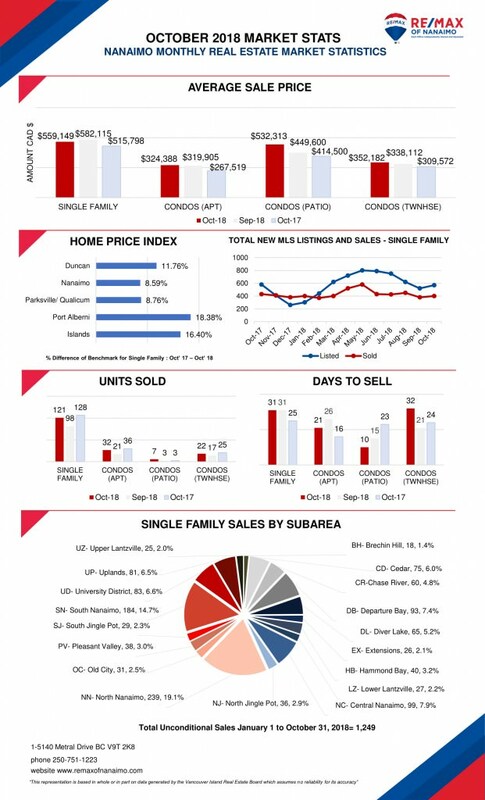 Single-family homes sales were 23% higher in October 2018 than in the previous month and condos saw an increase of 20% in comparison with September 2018. Pricing has decreased since September 2018 but it's more of an indication that the extreme seller's market we were seeing in 2016-2017 is behind us. This will put an emphasis on competitive pricing homes to avoid sitting on the market for several weeks. Island wide there is an expectation the new mortgage stress test, increased interest rates and increase sales tax on certain properties will affect the sales moving forward. In Nanaimo, with an older population not typically requiring loans, the market should be less affected by these new lending guidelines. If you've been wanting to buy, you should be able to have more time after viewing any property to make an offfer, especially compared to 2017. Patient buyers should be able to find better opportunities. It's important to remember multiple offer scenarios are still common just no longer the norm.